Despite the massive efforts of volunteer lifeguards, refugees are losing their lives in the Mediterranean. 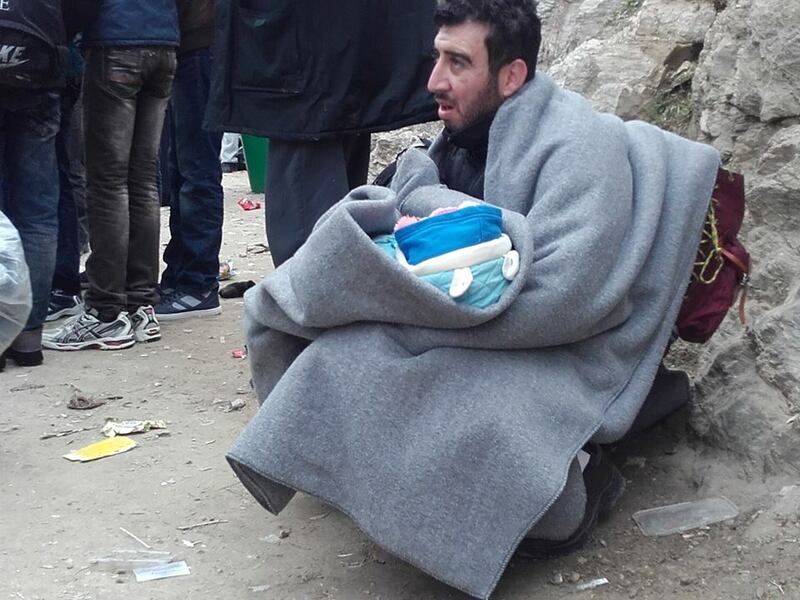 Europe must act… and out of compassion. These conscientious and courageous lifeguards take time off work to volunteer to save lives. Still shivering with the cold even in the golden foil they’d been wrapped in, two young Afghan girls were having a lively chat. Their mother was gazing out to the sea, mostly back towards Turkey, which they had departed two hours earlier on a grey dinghy. 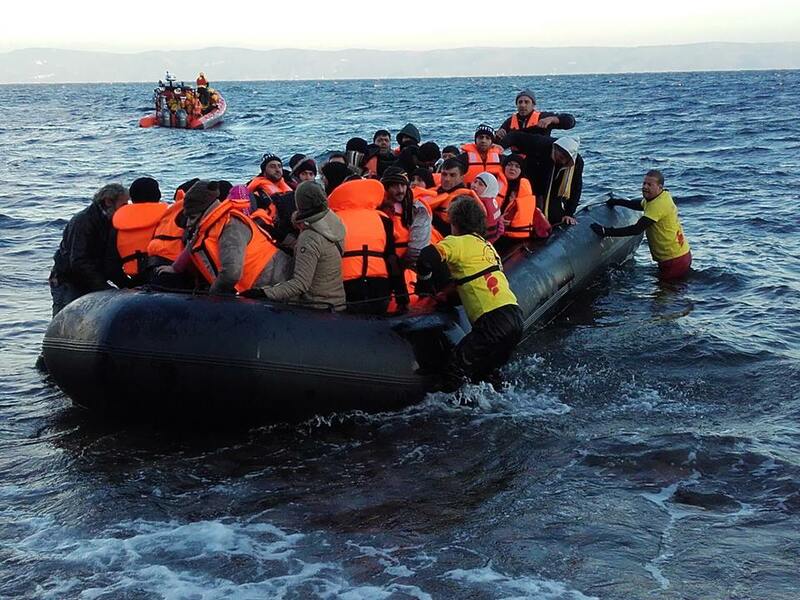 Some 20km from the shores of Lesbos, the grey rubber boat’s engine had given out. The boat started rapidly filling up with water, but fortunately the passengers were spotted by the staffof the Spanish NGO Proactiva Open Arms. All of its members are experienced lifeguards, veterans of Catalonian and Basque beaches. Almost routinely, they set out and made sure the three rubber boats reached the small port in the picturesque village of Skala Skaminies, where at least 20 lifeguards from all over the world are currently stationed. “It is cold, but I’m very relieved. We were getting desperate, but now we’re finally safe. I am so grateful to the people who came to rescue us,” smiled a black-garbed elderly lady from Douma, one of the quarters in Damascus hit hardest by the war. Madam S has lost both her sons to the conflict. 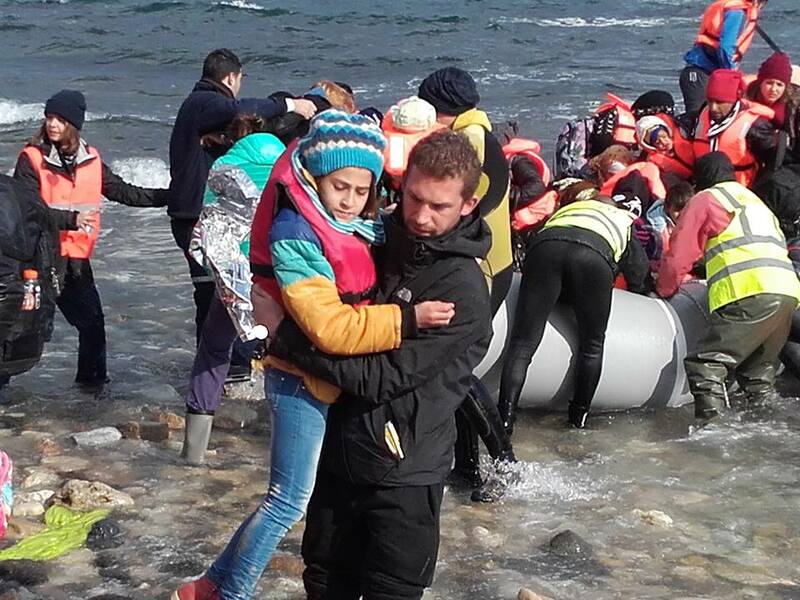 On her long journey to Lesbos, she was accompanied by her grandchildren and the widow of her eldest son. They had seen and experienced it all. They were visibly exhausted and not up to a long conversation. “We just want to get safe. We’re hoping Europe will take us in,” shrugged the younger of the two boys while fiddling with a pile of fake life-jackets. Most of these deadly fakes, it should be noted, had actually been made by Syrian children in garage factories all along the Turkish coast. Right now, the Syrian children are the ones who can provide the dirt-cheapest labour to be found. On Lesbos, countless NGOs and volunteers are toiling without pause to contain the tidal wave of human tragedy. But no matter how hard they try, it is never enough. The migrants and refugees keep dying on a massive scale. This was Joaquim Acedo’s second tour on Lesbos since Proactiva joined the action in September. Each team normally serves for 15 days, then its members go home utterly exhausted. All of them are participating on a purely voluntary basis, which means that the ones with regular jobs have to use up their vacation in order to be allowed to save lives. Last year alone, almost 450,000 people entered the EU through Lesbos – almost half of everyone who reached the Greek Islands through Turkey. Lesbos, one needs to keep in mind, is an island with some 90,000 residents and an exceptionally weak humanitarian infrastructure. Despite all that, it is now the EU’s key entry point for migrants and refugees. As things stand, there is almost no EU presence on the island, if we discount Frontex, the EU agency for securing the union’s external borders. In the months to come, the Frontex personnel’s jurisdiction is sure to widen considerably. The EU’s main “strategic” answer to the humanitarian tragedy is to strengthen its outer border, especially the border with Turkey. A part of this “solution” was the recent deal with the Turkish authorities to take on most of the responsibility for the incoming migrants and refugees. The sum handed over to Ankara by the European Union was €3 billion. Last year, around 350 people drowned on the perilous trip from Turkey to Greece – enough of them so that a new location for a graveyard had to be found in Mytilini since there was no more room in the old one. This year, 70 souls have already been lost to the journey. This particular crime against humanity is only getting worse. On the day I visited their venerable operation, the Spanish lifeguards saved more than 50 lives – lives that the European political elites and European public opinion increasingly perceive as a threat to their Christian way of life. “But how can this be? Such a view is absolutely unacceptable to a Christian,” exclaimed Father Christophoris, an Orthodox priest who I sat down with in a smoke-filled café in the nearby mountain village of Sikaminia. Almost 14 years ago, Kristoforis himself had made the long journey here all the way from California. This is why he now considers helping the migrants and the refugees to be the focus of his life’s mission as a priest. This remarkable blond-haired holy man is now at the heart of refugee relief co-ordination on the northern part of the island. The last time there was such an influx of desperate souls in these parts was in 1921 and 1922, when many Greeks were on the run from Turkey. They, too, had been very much a burden to the locals. Most of the people at the Moria refugee camp were shivering, some of them uncontrollably. On this day, the entire heart of the Mediterranean was wretchedly cold. The nearby mountain peaks had recently been whitened with snow, making the refugees’ journey even more ardous. Wrapped in swathes of golden foil and blueish blankets, the refugees were very grateful for each cup of hot tea handed out by the volunteers. The children kept clinging to each other as the women wrapped themselves tight in their shawls and headscarfs. The men were seeking out what information they could get on how to continue with their journey. Most of them were disheartened to find out that, owing to a shipworkers strike, all the ferries to Piraeus had been cancelled. For a while, all they could do was stare at their cellphones while trying to come up with a plan B. Said had reached Lesbos early that morning, accompanied by his wife, six sons and three daughters. The eleven of them formed a close huddle. Freezing half to death, most of them did not much feel like talking. They’d had to wait nine days to cross from Turkey to Greece. They borrowed most of the money they needed to reach Europe from their relatives. They have no idea how they will be able to repay them. I was talking to Farouk under a metal awning in Mytilini, where he and some comrades had sought shelter from the icy rain. The men were sifting through their options. They had no money to sleep in a hotel, and the combination of the rain, the cold and their utter exhaustion was preventing them from walking back the 15km to the refugee camp. After a while, a few stray dogs entered our grimy resting place. The Syrian youths twitched in something quite akin to panic, so the freezing animals took flight and retreated under a nearby staircase. The distance between the comfort zone and the bottom of the food chain is so often a matter of geographical and temporal coincidence. Farouk proved exceptionally well-informed about every aspect of the so-called Balkan refugee route. On leaving home, he knew that his chances of securing a new life in Europe were much slimmer than they would have been a few months ago. But staying put would have meant a much graver risk. The fact that Farouk hailed from Syria certainly increases his chances of breaking through to where he wants to go. But the chances of him actually being granted asylum are slim to none. The European (anti-)refugee and (anti-)migrant policies are degenerating by the hour. Within EU territory, several hundred thousand refugees have been waiting for months to enter the job market. Even Germany, having set an example by opening its doors wide open, eventually decided to reach for the handbrake. In many ways, it is little wonder. The Merkel administration is facing ever-more bitter opposition from within the ranks of its own party. The German open-door policy is irrevocably over. As a consequence, the Balkan refugee route is closing down. Last Tuesday, the Austrian authorities decided only 37,500 people would be allowed to apply for asylum this year. The regime at the Austrian-Slovenian border, where for the past three months the Schengen arrangements have become but a wistful memory, is sure to get even stricter than it is today. In the weeks and months to come, the Germans will start returning thousands of people to Austria, while the Austrians are bound to start funneling them off to the small barricaded country of Slovenia. At the same time, the Macedonian authorities have temporarily closed their Greek border at Gevgelija. As early as last autumn, the Macedonians at the border with Greece had begun to turn back the refugees who were not from Syria, Iraq or Afghanistan. According to our information, there is a rather substantial chance of them soon sealing the border entirely. The way things stand, the most likely scenario is that the brunt of the burden will once again fall on the economically ransacked Greece. Brussels, which recently sold its share of responsibility for the refugees to increasingly unstable Turkey, is about to re-sacrifice Greece at the altair of its own short-sighted interests. From here to the final rise of the neo-Nazi movements like the Golden Dawn is but a short step. The anti-refugee sentiment has become the European state of mind. 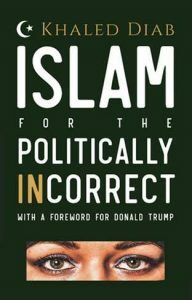 This is true both at the level of the increasingly xenophobic public opinion and at the level of the political elites, which have finally been freed from wearing the masks of political correctness. This not only pertains to the former communist parts of Europe, but also to countries like Switzerland and Denmark, where on arrival the refugees are now stripped of a part of their assets. 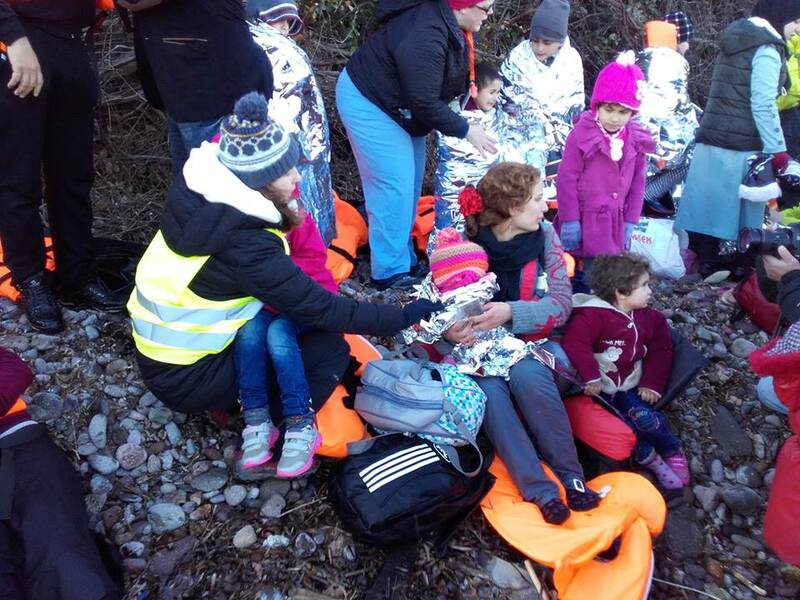 Contrary to popular rightwing myth, the majority of people waiting to board the boat were women and children. Last Friday night, several thousand people were waiting in the icy wind at the Mytilini port to get a ferry to Pireaus and Kavala. Due to a long shipworker strike, some 3,800 refugees were stranded on the island. Around 65% of them were women and children. All over the port, the refugees were seeking relief from the savage cold. Very few of them were appropriately dressed for such arctic conditions. Some of them were forced to wait out in the cold for five hours or more. Almost none of them felt like talking. The only thing they were interested in was the hour when the two ferries were scheduled to leave. Three Afghan youths had managed to set fire to a garbage heap and were now standing beside it to keep warm. They had been on the road for 30 days. “We will never go back. All three of us have borrowed money to get here. We first have to work hard to pay it back – only then can we start taking care of ourselves and our families. I want to work in the computing industry,” said 19-year-old Reza from Kabul. The half a dozen Greek policemen in charge ordered the great mass of freezing refugees to form three long columns. The two enormous ships were not set to leave for another two hours. By the time the refugees were finally allowed to board, most of them were so tired and cold they were unable to feel any joy. It was as if they were all too aware of what awaited them on the remainder of their Balkan journey.